Did you know that this year’s Lincoln Center Christmas Tree was born and raised in Columbia County? It’s true. While not as famous as the tree at Rockefeller Center, the lighting of the Lincoln Center tree has been one of the city’s annual holiday traditions for the past 18 years. The tree is a Colorado Blue Spruce, around 50 to 55 feet tall, which was planted in our county in 1971 and delivered to Lincoln Center today. This year’s tree lighting ceremony will take place on November 26, 2007 from 5:30 to 6:00pm on the Lincoln Center plaza. 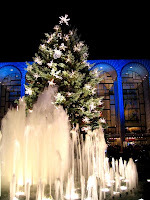 This entry was posted in News and tagged Christmas, Holidays, Lincoln Center, NYC. Bookmark the permalink.